We opened the blinds, and as soon as I peaked the snow blanket covering outside, we were up and out of bed and in our snow gear! The best part of a snow day is opening the door, watching our pup Reise run out, not expecting what is ahead. Lets just say that today’s discovery may have been a little much for her. 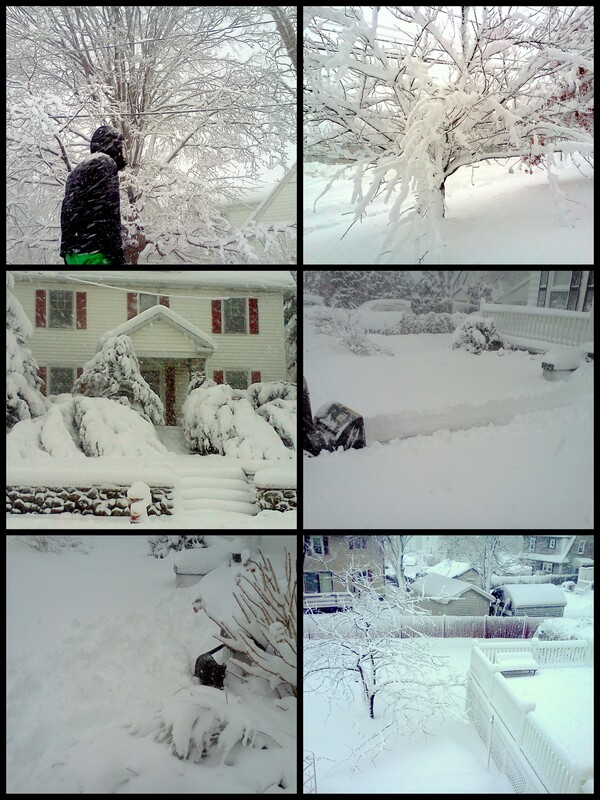 After some shoveling and snow blowing, we wandered around the neighborhood, awed by the scenery that the snow created. 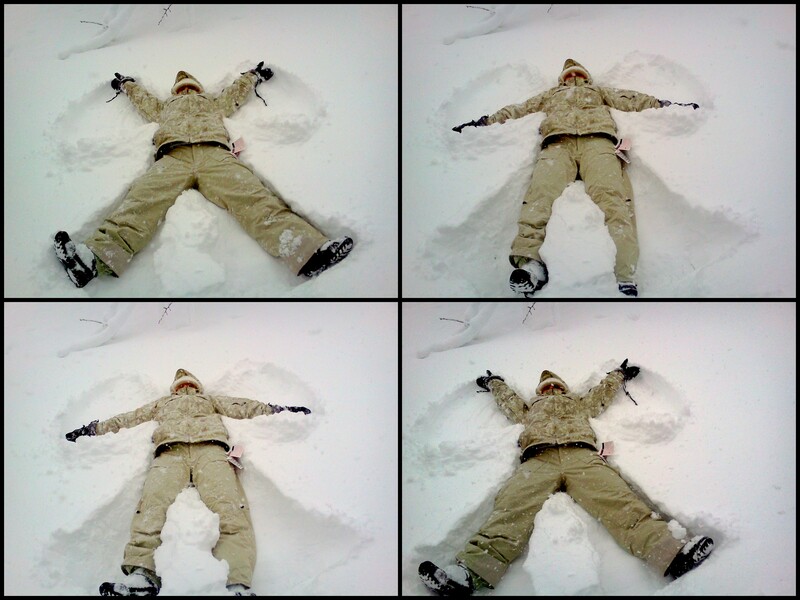 Across the street we found the perfect spot for my very first (successful) snow angel! By this time I was starving, and plans of slow cooking turned into dreams of junky convenience food! First up a thing crust spinach white pizza (of the frozen variety). A little tip, the thin crust frozen pizza are delicious and have about a quarter of the fat and calories of regular frozen pizza! A couple of hours later, and 3 episodes of Dexter – Season 2, and it was time for lunch. I had left over bacon from my potato soup toppings, so lunch was framed around bacon…always a good idea! For Ryan: Grilled Cheese and Bacon. 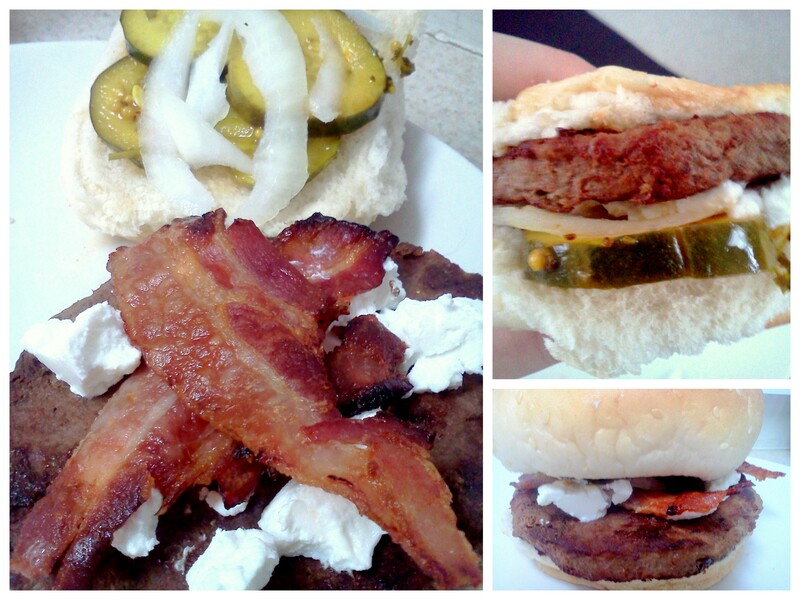 For Me: A Jenny-O Turkey Burger topped with Chavrie, bacon, homemade bread and butter pickles, and onion slices. Now, I was not expecting a culinary delight for lunch, but this burger SERIOUSLY surpassed all of my expectations, and has easily made it to the top of my favorite burger list. 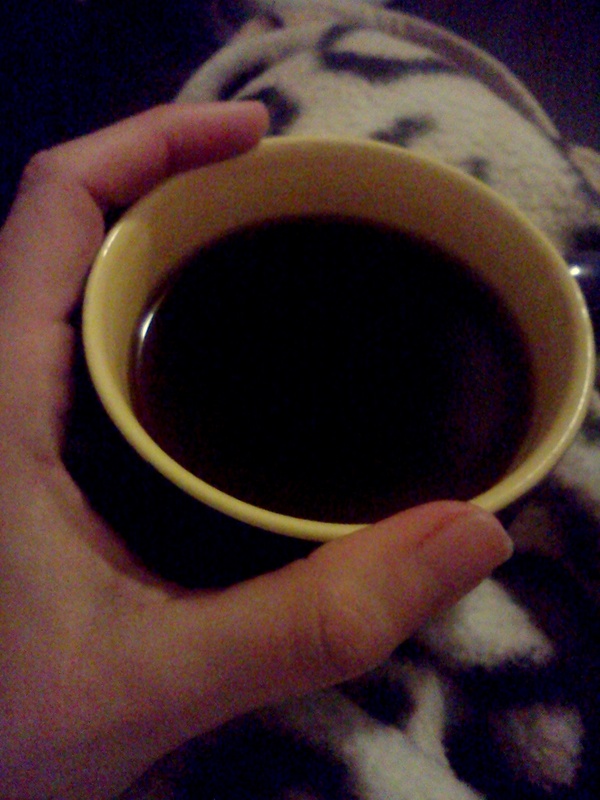 Next up was some of the delicious strawberry tea my sister brought me from the Camellia Rose Tea Room in Plant City, FL. I have this tea every time I am in Florida, and it is so delicious! When she came up for my birthday this year, she bought me a tin to enjoy in my new tea room! And then it was time for more shoveling of snow and to clean the cars off. And then I was sad because it meant the snow day was almost over. BUT, there was more fun to be had! A quick trip to the store for milk and snacks (read: chocolate) found us in a half plowed CVS parking lot. It was time to take the new Highlander for a spin! That baby handled the snow piles like a dream, and we left the lot happy to make our next car payment! By the time we got home, any preconceived ideas of cooking a healthy dinner were out the window! Orchard Park Grill Wings here we come! 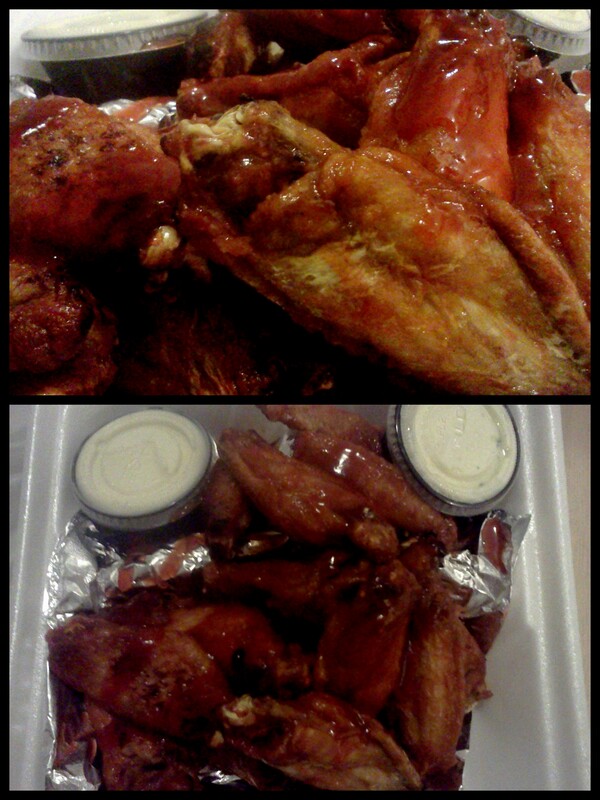 Buffalo wings are one of my greatest weaknesses. OPG is not the kind of place I want to go in, sit down and unwind at. It is definitely a “local bar”. However, the secret of this watering hole is there insanely delicious, perfectly cooked OPG wings. We found out that one of the secrets of these wings are that they are fried and then broiled, which gives them a perfect texture. The next secret is the sauce, a flavor burst of honey, buffalo and a touch of bbq, the sauce is pretty darn perfect! And with that, our snow day came to an end. But it was a much-needed respite in the week, and some great time spent with my family…plus, calories totally don’t count on snow days! Did you enter to win prizes from Pretzel Crisps and Tribe Hummus yet? This entry was posted in Random and tagged bacon, blogger, boston, buffalo wings, burger, chavrie, chicken wings, fozen pizza, MA, opg, orchard park grill, pickles, snow day, strawberry tea, vegetarian, watertown, wings by reneeh. Bookmark the permalink. Calories totally do not count on snow days! I dint get to make a snow angel but I wish i had. 4 wheel drive is a good investment around here! Looks like you had a great day! Mine was spend indoors staring at a stock pot. Ha! I saw your post on making the beef stock, I have almost gotten the nerve to try it, but I think I will take your advice and go with the chicken stock! Sounds like you had a great snow day. I had baking plans too but those dreams quickly vanished especially after the snow kept piling up.